What are the main requirements of a burning software? It should obviously support all operations that a user would need. It should also be fast, resource friendly. Free would be nice as well. Lots of different CD burning software programs are available these days on the Internet, from CD Burner XP over Deepburner to IMGBurn. Most of them handle the basic burning operations just fine but many are unfortunately making them more complex than they should be. Others use to many resources, have an irritating user interface or crash to often to make them the burning software of choice. 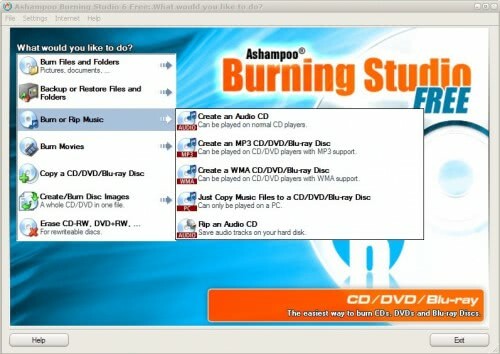 Ashampoo Burning Studio Free is an old version of the burning software of Ashampoo which has been released to the public. Everyone can download and use it without having to register or pay money for it. It starts up reasonably fast without splash screens and long loading times. All operations are selectable from the main menu. Some operations are further divided, the Burn Files and Folders category contains options to burn a new disk or update an existing one. The list is pretty comprehensive. The most popular image formats (img, iso, cue/bin) are supported by Burning Studio Free which should be sufficient for most users. Most impressive is the responsive interface which is much faster than that of Nero and similar applications. If you are looking for a fast, responsive and high-quality burning software that does not cost a dime you should take a closer look at Ashampoo Burning Software Free. It might exactly be what you are looking for. I switched immediately from IMGBurn to it. IMGBurn was unfortunately rather complex to use. One example. To burn mp3 to disk one had to create a cue file before that was possible. Ashampoo simply takes the mp3 and burns them right away. I did not register the product and do not see that there is a time limitation or other limitation. Using V6.61 here, didn’t realise they’d released an update as I have that blocked. Does yours not have a ‘Register’ link in the Help and Internet menus? I have been using it for over a week now and have not seen any reminders yet. Will let you know what happens when I reach the tenth day. Very nice, now, how can I burn a disk if I don’t have a administrator account? Very cool, looks like great competition to CDBurnerXP. Nice find gHacks. I’ll care about their products when they make their free firewall xp sp3 compatible! I use Ashampoo a lot for CDs, but I find it pretty much useless for DVDs.